If you ever start designing amigurumi this will quickly become a problem. It's distracting! Just last night I was watching "Nut Job" with my youngest son and just as soon as the movie started my mind instantly went to work amigurumifying all the characters. Oh, and the family will also be part of the problem. My son did say a few times throughout the movie, "You should totally make that mom!" 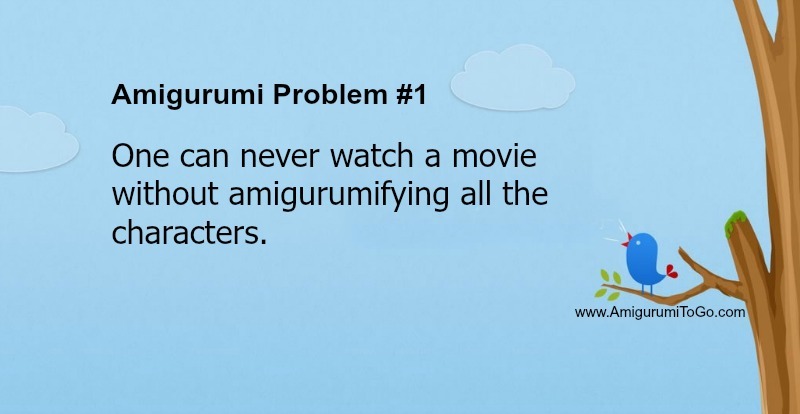 Anyone suffer from this problem? Or have any other ami designing problems? Feel free to leave a comment and maybe yours will be "Amigurumi Problem #2" next week. Hi, Sharon! First I want to thank you for your generosity in sharing the wonderful patterns you design. You have a heart of gold and an amazing imagination and talent. I have a problem similar to yours, but it is with embroidery. I see things and start imagining how I turn them into either hand or machine embroidery. I start to envision them in quilts, on tote bags, on clothes, whatever. But I think it is the same way with all designers. We are constantly thinking about our designs and future designs. And I wouldn't want to be any other way. So please keep envisioning amigurumi wherever you are. We love what comes from it! Hello Cynthia, first of all what a beautiful name! And thank you for the kind words, I really do appreciate that. I have been looking at embroidery and how beautiful it truly is. I haven't done much embroidery myself but I'm in awe of those who make it an art form. It's just an awesome thing to have designer eyes and be able to see things differently. It's distracting but I do love it. I can't imagine not making things, designing things... and loving everything! Sharon (what a great. name) if I do say so myself. I agree with your designer problem 1, even the kids on my son's robotics team chime in! One of my greatest challenges is: designing quicker and wanting to create faster than I can crochet. My brain always seems to b. many projects ahead of my fingers! And there are always those mundane things like the care and feeding of children that get in the way! Thank you for all that you do and share. And absolutely, there's the kid's friends too, I forgot about that (but how could I forget?!!) It's true though, we need to be faster than the requests and faster than our fingers..
You're so welcome and thank you!! lol, I can totally relate on all accounts! Everyone in the family, including myself, has their own wish list....and it is always growing! So many things to create, so little time! Thanks for all your generosity! One month ago, I would have thought...crazy! But looks like I am the crazy one now. While watching Inside Out with my god daughters, I was trying to figure out whether each character could be amigurumi-ed! But what I really want to say to you is a big thank you for your time and patience to get people like me 'hooked'. Your videos are easy to follow. So much so that a group of friends (like me, they had not heard about amigurumi till recently) and myself have committed to crocheting dolls for all the ward paediatric cancer children in a hospital I used to work in (our Christmas project for 2015). We will be using a lot of your patterns especially your Wee Bits series. So really...a big BIG thank you for enabling us to even dare attempt this.